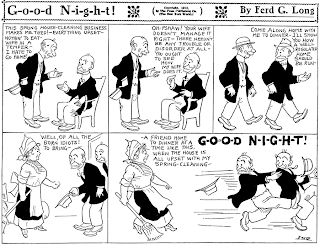 Thursday, February 13 1908 -- Herriman ends his Mr. Amos Pidjin strip today, logging in a total of five delightful episodes. Today in Sports, however, will continue; today's installment recounts the wrestling matches of the previous night and looks forward to a spring visit from the Chicago White Sox. Walter McDougall and His Artistic and Literary Labors. New York, Nov. 23,—Pictures in the daily papers are of comparatively recent date, but they have been used for a time so long that Mr. Walter McDougall, the cartoonist of the New York World, who joined the staff of that paper a few weeks after this phase of journalism had been inaugurated—and The World it will be remembered was the pioneer in this new department—finds himself today older in service than any other man in Mr. Pulitzer's employ. The effort to print pictures in daily papers did not promise well in the start, and the portraits of the men and women, when the names of the individuals were added, were absolutely libelous. Mr. Pulitzer was determined to do something novel with The World, and he persisted in the illustrations, bad though they were. One day a young man sent up by the elevator boy a cartoon of Mr. Blaine, who was then running for the presidency. In a few days the cartoon appeared and the young artist called to see how much he was to be paid for the work. When the elevator boy heard his name he took him at once to Mr. Pulitzer, who there and then engaged him to work for The World on a liberal salary. 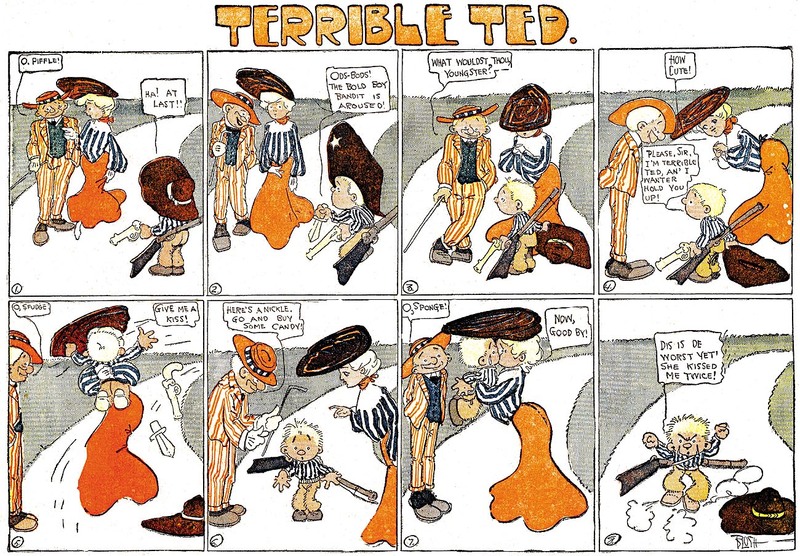 This was Walter McDougall, who has since explained that the cartoon had been rejected by Puck and Life, and he left it at The World office because he did not know what else to do with it. It appears that The World printed the cartoon just as the young artist had made it, without any reduction, and the bold lines proved to be just what was needed, so that there should be a clear impression printed in the paper. Since then there have been vast improvements made in the art of printing illustrations, but to Mr. McDougall belongs the distinction of having drawn the first cartoon which appeared in The World clear in its lines and not besmirched with ink in the printing. Since then Mr. McDougall has worked steadily on The World, and every reader of that paper is familiar with his name and work. He was the first man to make what might be called view illustrations, that is pictures of occurrences of one day to be printed in next day's paper. Perhaps, however, Mr. McDougall is known to a wider public than even The World reaches as the illustrator of Bill Nye's letters, which week by week for many years have provoked the laughter of a continent. When I met Mr. McDougall recently I asked him how he managed to always hit off Nye with exactly the same smile. He said that he made a sketch of Nye when he first met him, and while listening to a case in court which they were reporting together, and that Nye as he appeared then had become fixed in his memory and he could draw him now without thinking of what he was doing. Even while he talked Mr. McDougall had drawn a head of the gentle humorist on the back of an old envelope and the picture was as natural as life. "By the way," said McDougall, "I once drew a head like this on an envelope, inclosed a letter in the envelope and dropped it in the New York post office. The next day it was delivered to Mr. Nye at his home on Staten Island, there having been added in the post office in red ink, 'Try New Brighton, Staten Island.' " This shows how well known Mr. Nye has become as depicted by McDougall's pencil. 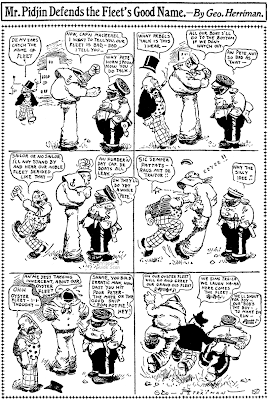 Previous to Mr. McDougall's employment on The World he had made pictures and written for the comic weeklies, and also for more serious publications. He had been also an engraver and designer, and had been the artist of a survey of the Colorado canyons. He is not content to let his work in drawing cartoons absorb all of his time, and he frequently does work of a greater finish and of a more ambitious nature. For awhile he contributed most of the sketches for a very nice illustrated paper, The Suburban, of which he was part owner and which was published in his native town, Newark, where he still lives. Mr. McDougall is proud of the work he did for The Suburban, but he is very sorry that he was a part owner of that now defunct weekly. Only quite recently Mr. McDougall has appeared as an aspirant for serious literary laurels, and in a novel, "The Hidden City," published by the Cassells, he throws down the gauntlet boldly and bravely. The idea of his story is new and bold, for he tells of life in a city of the stone age, placed in the world during what might be called its electrical periodic. This is not done in the humorous way in which Mark Twain took his Connecticut Yankee inventor to the court of King Arthur, but it is told with all seriousness and gravity. Mr. McDougall has just passed thirty-five, but he is one of those blond men with pink and white complexion who will always look younger than he is. This does not mean that he is at all effeminate. That is not the case by any means, for he is essentially a manly man. His manner is quick and responsive; his smile is easily provoked and his eyes twinkle at all the funny things to be seen in this all too sad and serious world. [Walter Hugh "Walt" McDougall was born in Newark, New Jersey on February 10, 1858, according to Who's Who in America, 1901-1902, Volume 2 (1901). In the 1860 U.S. Federal Census, McDougall was the fifth of six children born to John and Elizabeth. The family lived in Newark, New Jersey. His father was an artist. They remained in Newark in the 1870 census. According to Who's Who, he was "educated at military academy until 16, later self-educated"; "began artistic work, 1876"; and married in "Newark, N.J., April 24, 1878, F.M. Burns." McDougall has not been found in the 1880 census. The Newark, New Jersey Directory 1891 listed him at 39 East Kinney; he was an artist for the New York World. The Jersey City, New Jersey Directory 1893 recorded him at 1254 Garden. In the 1900 census McDougall was a newspaper artist boarding in Manhattan, New York City at 2420 7th Avenue. The head of the household was Alice Graham. Who's Who said his address in 1901 was 1131 S. 46th St., Philadelphia. The Artists Year Book (1905) said his office was at The North American, Philadelphia, Pennsylvania, and home in Atlantic City, New Jersey. Two of his strips, this decade, were Peck's Bad Boy and his Country Cousins and Mister Makepeace. Ten years later McDougall was married and had a son in Montclair, New Jersey at 106 Claremont Avenue. Not only was he was counted in 1910 federal census, but also in the Pennsylvania state census; the head of the Philadelphia household was Alice Graeme. Hmmm. By 1920 he was a widower and lived alone in Middletown, New York at 10 Union Street. McDougall's autobiography, This Is the Life, was published by Alfred A. Knopf in 1926. The Syracuse Herald (New York) published "Funniest Memories of a Famous Cartoonist", a full-page of anecdotes from the book, on August 22, 1926; included were a self-portrait (above right) and photo of McDougall (top). George James Beaty was born in Cedar Falls, Iowa on February 13, 1892, according to his World War II draft card. He was recorded in the 1895 Iowa State Census. In the 1900 U.S. Federal Census, he was the youngest of two sons born to David and Mary. They lived in Cedar Falls, Iowa at 1007 First Street. His father was a miller. The date of their move to South Dakota is not known. In 1910 Beaty and his parents lived in Madison, South Dakota at 711 8 Street. His father was in real estate, selling land. According to the 1930 census, Beaty married Irene when he was 23 years old, which would have been in 1915. He signed his World War I draft card on June 5, 1917. He lived in Chicago, Illinois at 7 East Chestnut Street. He worked as an artist for the A.W. Shaw Company. His description was tall and slender with blue eyes and brown hair. In 1920 Beaty and his wife lived in St. Joseph, Michigan at 814 Broad Street. His occupation was commercial artist at a publishing company. The Daily Herald (Chicago, Illinois) reported visits to his parents, in Arlington Heights, and vice versa. December 29, 1922: Beaty, wife and son, David, visited at Christmas. October 24, 1924: Wife and son visited her parents in Oklahoma, then his parents and brother before returning home in Pittsburgh. September 18, 1925: The Beatys visited his parents and brother. 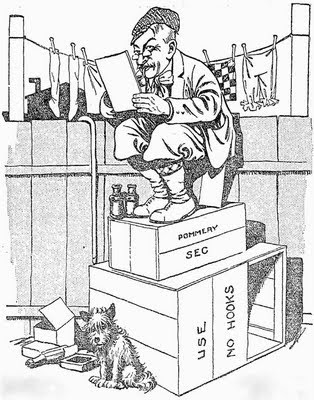 July 16, 1926: "Mr. and Mrs. David G. Beaty…went to Atlantic City to visit their son, George Beaty, who has a fine employment as cartoonist." In 1930 the Beaty family of four lived in Absecon, New Jersey at 834 Shore Road, a few miles northwest of Atlantic City. He was a commercial artist at a sign company. The date of his move to Connecticut is not known. 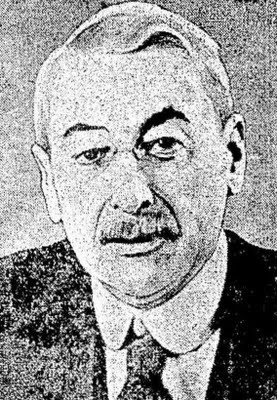 He was listed in the Bridgeport Fairfield, Southport Stratford DIrectory at four different addresses, from 1931 to 1939. (The available directories at Ancestry.com.) His father passed away in August 1931 according to the Daily Herald. The 1940 census is not available. One of his strips was Want Ad Willy. A bound volume of The Writer's Market (Writer's Digest, 1945) had the following listing on page 202: "Want Ad Willy, 410 State Street, Bridgeport, Connecticut. George J. Beaty, Editor." Beaty signed his World War II draft card on April 27, 1942. He lived at 71 Grasmere Avenue in Bridgeport, Connecticut, and worked at the Post Publishing Company. The Daily Herald published the following item on January 7, 1944: "Mrs. D.G. Beaty received sad news last Thursday [December 30, 1943] telling of the death of her younger son, George, in Connecticut." According to the Daily Herald, his wife and daughter moved to Tulsa, Oklahoma, and his mother passed away in June 1946. What a shame that we lost Albert Bloch to fine art just as he was really getting the hang of comic-stripping. 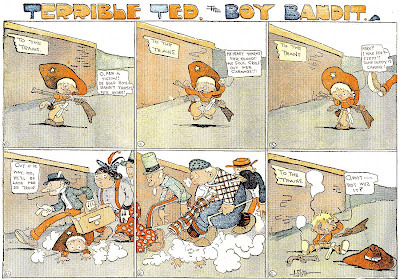 To see Bloch's advancement as a cartoonist, check out 1901's Constable Hayrick the Rustic Sleuth, an absolute abomination, then 1902's Professor Wayupski, much better drawn but still a little iffy on the progression between panels, and then today's obscurity from 1903, Terrible Ted the Boy Bandit. 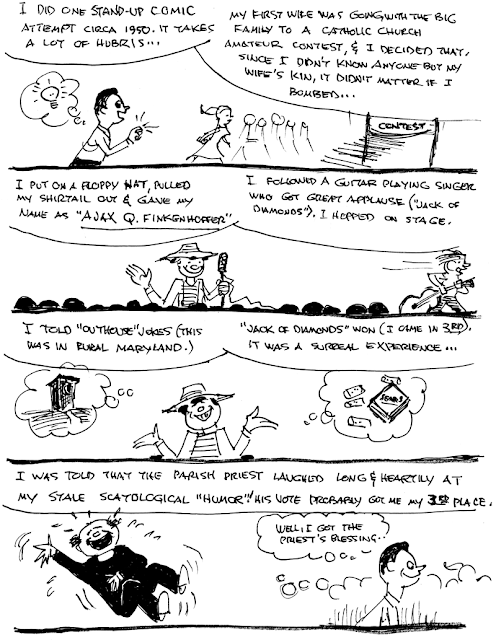 Terrible Ted is the work of a confident cartoonist. He's minimizing his speech balloons, his pacing is spot on and the gags are properly executed and very cute. Imagine what he would have been producing another two or three years down the road. Ah well, such was not to be. No, Albert dropped cartooning like a used Kleenex after spending three years at the St. Louis Star. He went off to seek stardom in fine art, and he got a good measure of it. Bloch became associated with Kandinsky (a self-important windbag who hoodwinked the art world into hailing him as a great painter ... but I digress) and was one of his 'Blue Rider' group. Bloch produced some really striking modernist works that were exhibited at the much-discussed avant garde shows of the 1910s, and later became a respected art teacher. To see some of Bloch's remarkable work check out the University of Kansas website. Terrible Ted ran in the proto-World Color Printing section of the St. Louis Star and a handful of other papers from April 26 to August 2 1903. It was his last work with the paper. Obscurity of the Day: G-o-o-d N-i-g-h-t! I consider Ferd G. Long one of the newspaper cartooning undiscovered gems of the 1900s and 1910s. His cartoons were a constant feature of the New York Evening World for almost two decades, and yet today you'd be hard pressed to find anyone who has even heard of him. 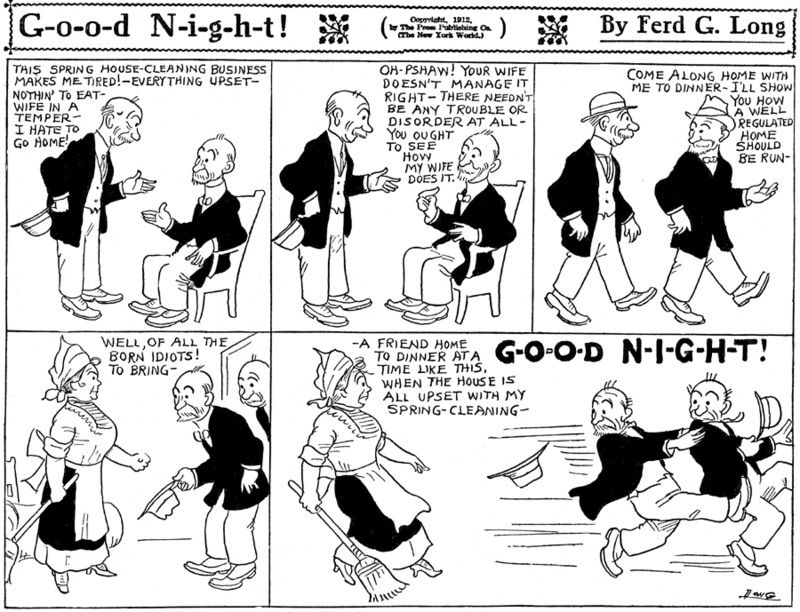 He was a naturally funny cartoonist; just the look of a Ferd Long strip has you smiling before you get to the reading. And his art was not only funny, but supremely confident and well thought out. Just look at the spotting of the blacks and the economy of line on the examples above -- superb stuff. 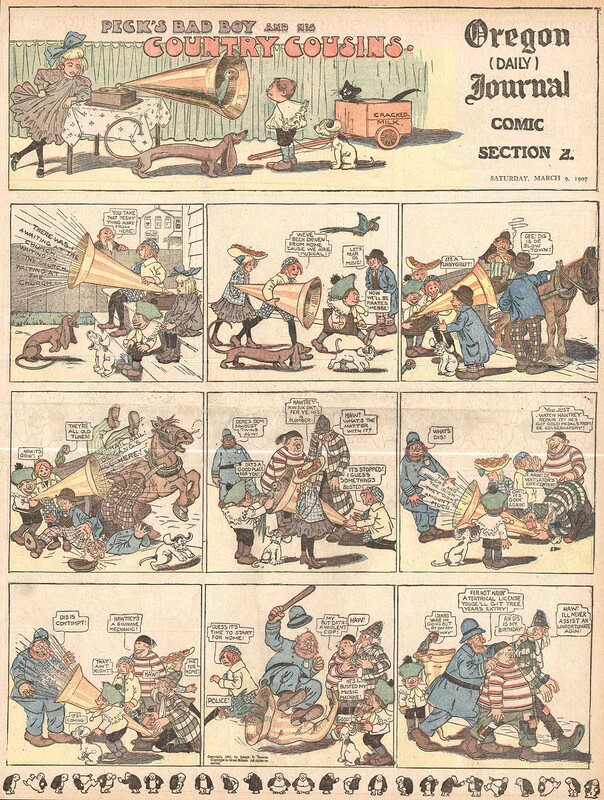 Long's only failing is that in trying to get his daily work done, which typically involved not only a strip but also spot illustrations, news illustrations and seemingly whatever else they threw at him, some of his strip work can be perfunctory, humor-wise. Good Night!, which ran in the Evening World from February 27 1911 to December 19 1912, is an example of that. In the early days of the strip there was a great slow burn effect, capped off with the seemingly unflappable protagonist finally losing his or her calm and screaming out "G-o-o-d N-i-g-h-t!" as the other characters scatter to the wind of the oral explosion. Ferd should have dumped the concept when it ran out of gas, but he kept on with more generic gags that didn't really lead naturally to the final outburst (I nominate several of the samples above as illustrations of that). Now being a Ferd Fanatic, I must point out that three of the four examples above are really unfair to his art. 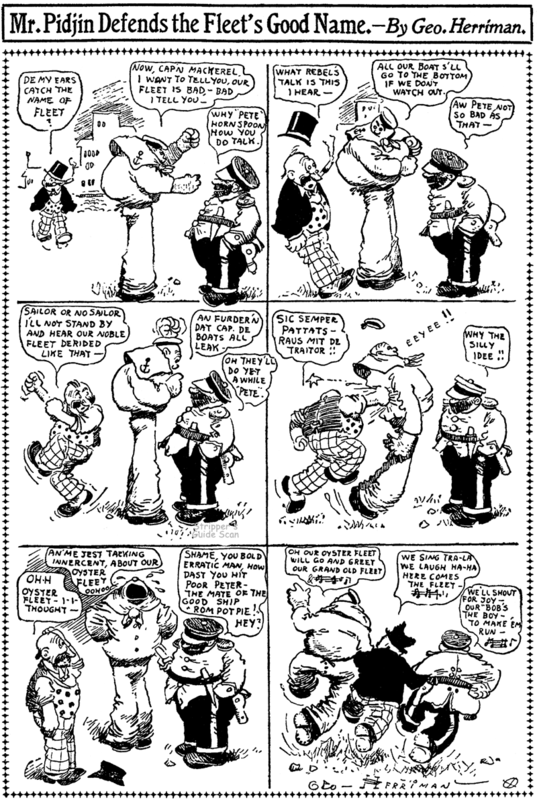 The newspaper that ran the one-tier strips reformatted them that way. And boy did they do a bad job of it. Just goes to prove that some newspaper folks have way too much time on their hands. Why take a two-tier strip, so well-designed for that layout by the artist, and cut it all up, apparently without even the benefit of a straight-edge? It even looks to me like the bottom sample might have lost a panel in the translation -- the second panel doesn't seem to make any sense. Who is he talking about? Ferd Long is a mystery to me in that his work for the Evening World is drastically curtailed after 1917. 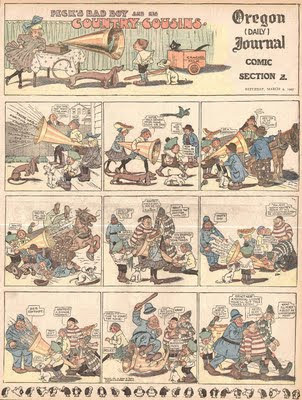 In 1918 and 1919 he does a few short series, often fill-ins for other cartoonists, but by and large he is gone. And after mid-1919 he is never seen again. Frankly I expected to find an obituary, and I scanned the Evening World microfilm for months of 1919 looking for one. Considering the severity of the flu epidemic of 1917, my guess was that Long got caught up in that, made a few rallies when he was able to return to the paper for short stints, but then died in 1919. But no obit was found. So a good thing that we have Alex Jay on board, who will fill us in on Long's bio tomorrow. What is the newspaper that cut these strips up and refit them? Sorry Grizedo, don't know. Those scans came from Cole. The properly formatted one was mine and it came from the Minneapolis Tribune. Hello, Grizedo----My examples came from THE MILWUAKEE SENTINEL, November and December, 1911. ---Cole Johnson. Ferd Is my paternal grandfather and passed along creative genes to some descendants. His great grandson, my nephew, is a very skilled artist. Another great grandson is an actor/producer/screenwriter. My father's sense of humor was legendary (John H). If you encounter any more data please let me know. Now THAT is a contest that I'd have loved to seen. Perhaps Jim should polish up some of his jokes and try his hand at stand-up again. I can guarantee a crowd of supporters!